Most customers, when they visit our stores, know beforehand what roller blinds or shades are. However, most are not familiar with its add-ons or optional parts. One of the high-impact optional parts available are valances and are further divided into two types i.e. white and acetate. There are other customizable parts like the chain composition and bottom tube shapes but in this article, we’ll be showing one with and without valence. Our valence have a white glossy finish and its dimensions are 3 inches tall and 3 inches for its depth. 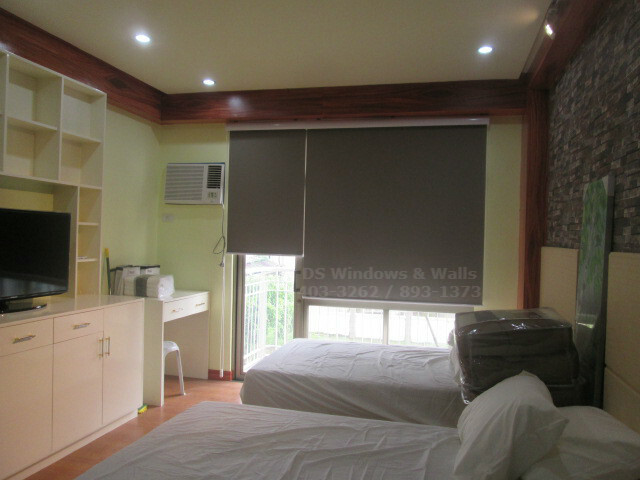 Our featured client from Makati Philippines opted for a dark colored roller blinds with white valence. As you can see in the photos, the white glossy valence gives the window covering a more elegant appearance. It hides the details of the blinds mechanism and replace it with a simpler but more classy appearance. Its counterpart is the acetate valence which takes a strip of fabric and place it inside the acetate valence that creates a visual appearance of a continuous fabric all throughout the window covering. White valence to some people breaks the monotonous appearance of the fabric and highlights the valence instead of cover it with fabric (like in the case of the acetate valence). More specifically they chose R5353 Khaki from the Regent blackout series. This fabric is a bit darker than usual and are most suitable for Bungalow type residential or houses in subdivisions since dark colors are usually not allowed in high-rise condominiums. Darker fabric colors offers a better heat insulation since darker colors tend to absorb heat more efficiently. Dark colored fabrics also offers a dimmer room suitable for people that wakes up late in the morning. We included a photo for roller blinds without valence just so you can also see the difference and compare the two. Without valence, the blinds can still look fabulous but one disadvantage is that sunlight can penetrate the gap between the window head jamb and the roller blinds head tube. Although this is only the case for inside mounting and not an issue for outside mounting. The advantage of valence-less roller blinds is that it is more straight-forward and is cheaper since valence is just an add-on parts. 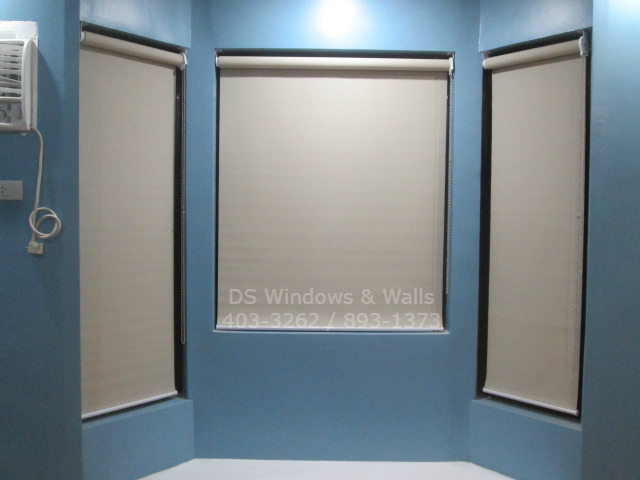 DS Windows and Walls has been in the blinds and shades business for over 10 years and we also conduct free ocular measurement. Our agents are highly trained to ensure a perfect fit for all your window covering needs. We also have branches in malls that you can also visit. 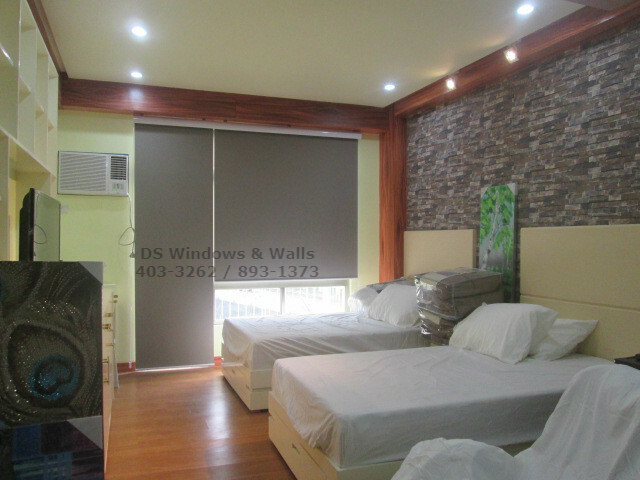 You may also contact us at (02) 403-3262 or (02) 893-1373 or (02) 668-9668 or email us at inquiry@dswindows.com.